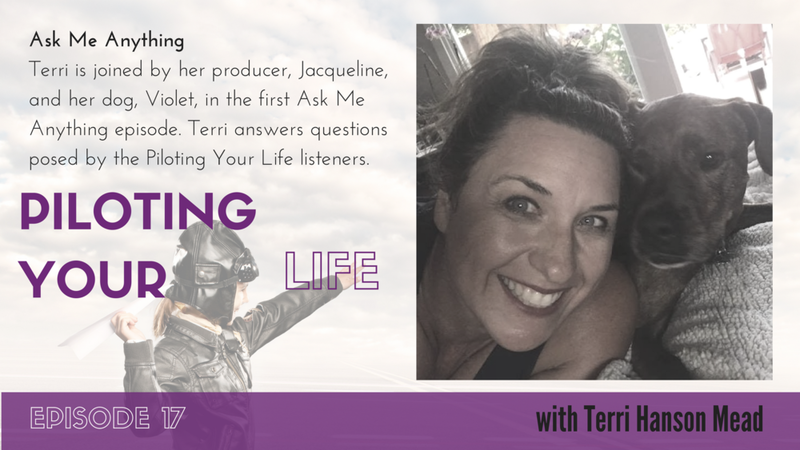 Terri is joined by her producer, Jacqueline, and her dog, Violet, in the first Ask Me Anything episode where Terri answers questions posed by the Piloting Your Life listeners. Jacqueline wants to know when Terri realized she was a connector and where the skill come from. How has being a twin shaped you? You have had an amazing life and journey, but no one is perfect. What would you correct with the luxury of hindsigh? Terri’s brother BJ asks what her favorite childhood memory was with him and their sister Sherry. When you are driving, what do you do? Meditate? Listen to the radio or podcasts? Catch up on business or personal calls? How do you keep up your passion and energy for all that you do through all trials and tribulations of work, home, investor ups and downs and manage to balance it all? How do you do all that you do and stay motivated? Your mom is exhausted just reading about your life.